Welcome to the Dougan Lab! Located at Dana Farber Cancer Institute, the Dougan lab studies immunotherapy for cancer using novel mouse models. 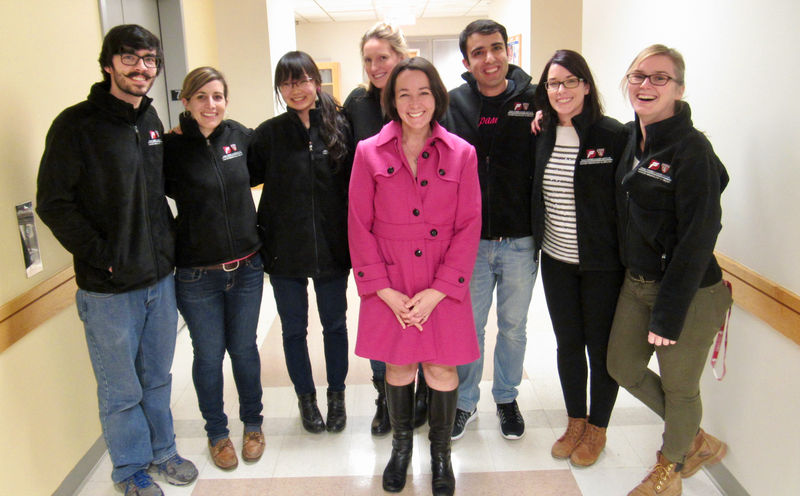 Dougan lab is saddened by the loss of our colleague and friend, Jessica Ingram. Jess was known for her meticulous and thoughtful approach to science. She trained numerous students and postdocs, and was always available to talk about scientific ideas or to help troubleshoot problems. She enjoyed going to seminars on diverse topics, believing that a broad understanding of biology is the best foundation for creative inspiration. As a postdoctoral fellow in Hidde Ploegh's lab, then as an Instructor in the Dougan lab, she developed an alpaca antibody platform for cancer immunology, and used protein engineering to design novel applications for single-domain antibodies. In the last year alone, she published 5 first author papers using single-domain antibodies, as well as an Annual Review of Immunology article on the subject. Jess was talented, kind, a good collaborator, and will be very much missed. A memorial lecture is being planned in her honor. Donations to the lecture can be given at this site. November 17 is World Pancreatic Cancer Day. Dougan lab is wearing purple to show our support in fighting this devastating disease! Learn more at www.pancan.org. Dougan lab picnic in the Boston Public Gardens, summer 2015. Dougan lab gets a new coffee maker! Paul Tyler and Mariah Servos win a poster award for their work on T cells fighting melanoma. Congratulations to our Bright Futures Team! Dr. Wilfred Ngwa, Dr. Rajiv Kumar and the Dougan lab are studying synergy of radiation and immunotherapy using gold nanoparticles to enhance local tumor cell kill and anti-CD40 to activate antigen presenting cells. We will be testing these devices in pancreatic cancer. Thank you to everyone who voted.